Our little homeschooler has been familiar with simple machines for sometime now. He has been reading books on power plants way before simple machines were introduced in his Level 4 Science subject. 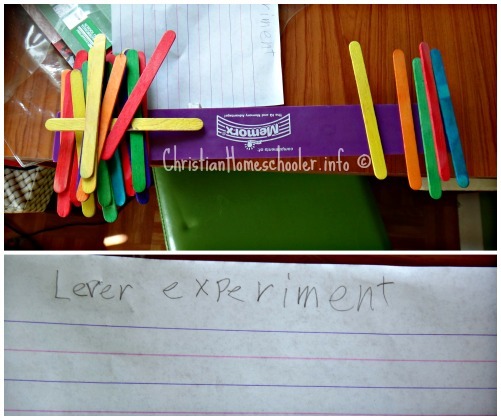 Today, he further learned more about Inclined Planes, Levers and Wedges and took upon himself to make this simple experiment he was instructed to do. 1. Stand a block on edge. Balance the ruler on this block. The block becomes the “point,” and the ruler becomes the lever. 2. Make a chart under the word “point,” write the inch number of the ruler which is above the point block. Under the word “left,” tell how many blocks are on the left end of the ruler. Under the word “right,” tell how many blocks are on the right end of the ruler. 4. Move the point block to the 5 inch mark on the ruler. 5. Leave three blocks on the right end of the ruler. How many blocks wil you have to put pn the left end to balance the lever? 6. Move the point block to the 4 inch mark on the ruler. Repeat step 5. 7. Move the point block to these positions and repeat step 5: 7 inches and 8 inches. 8. If you wante to life a large rock with a lever, where would you place the point? At point a, b, c, d, e or f? We also learned today that ramps and screws are are inclined planes. He made a model of a screw which I totally forgot to take a photo of. Since he wanted me to upload the recorded video I took of him playing the piano while his father plays guitar bass fender marcus miller on his iPad. Back to the model screw our homeschooler worked on, he demonstrated how a screw is really an example of a flat surface which slopes. He took a piece of paper that is 3 inches wide and 5 inches long. Drew a line from one corner to the other and cut along the line from one corner to the other. The piece of paper then looked like an inclined plane. Starting from the long side, he turned the paper around and around the pencil. A screw is an inclined plane that winds around a center.